Thomas Cummins was born on the 19th February 1875 at 12 Northumberland Street, North Shields, and was the first child of William and Elizabeth. 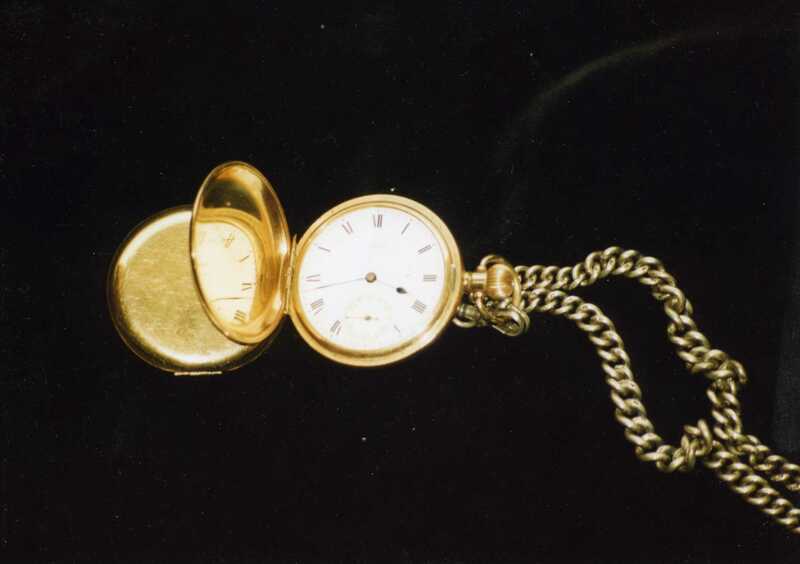 In 1889 when Thomas was only 14 his father died, so a lot of responsibility would have fallen on his young shoulders, as the man of the house he would have had to help his widowed mother to bring up the family. Thomas had started his working life as an apprentice carpenter but because of his fathers death he had to leave his poorly paid apprenticeship and get a job as a fisherman. In 1898 when Thomas was 23 he married a widow called Elizabeth Wight whose first husband, a local fisherman called John Wight had been drowned when his fishing vessel the “Alderman” had been sunk in a storm at sea. Interestingly his marriage certificate listed his age as 26. 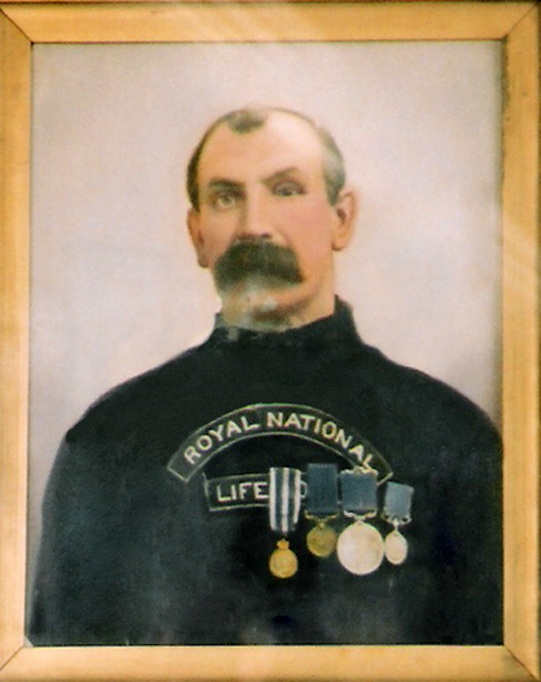 Thomas worked for most of his life as a fisherman and labourer, and for many years was a member of the Tynemouth lifeboat crew, a voluntary job that he loved. He first joined the lifeboat service at the turn of the century when the lifeboats were either pulled or sailed; as a hard working man of his generation it was said he was strong enough to snap an oar. In May 1905 a new lifeboat the “J.McConnel Hussey” was sent to be stationed at Tynemouth, this new lifeboat was one of the first to be powered by an engine, there was however a great reluctance by the local fishermen who normally formed the crew of the Tynemouth lifeboat to put their trust in it. The new motor powered lifeboat was manned by sappers of the Royal Engineers, as the new boat began to prove herself, some, but not all of the local men gradually lost their mistrust of the new motor lifeboat earning their rightful places aboard her. Thomas was one of the first, enduring the jeers and taunts of the local boatmen whenever they took her out, but his foresight recognised the potential of a powered lifeboat and he started to learn all he could about the engine. 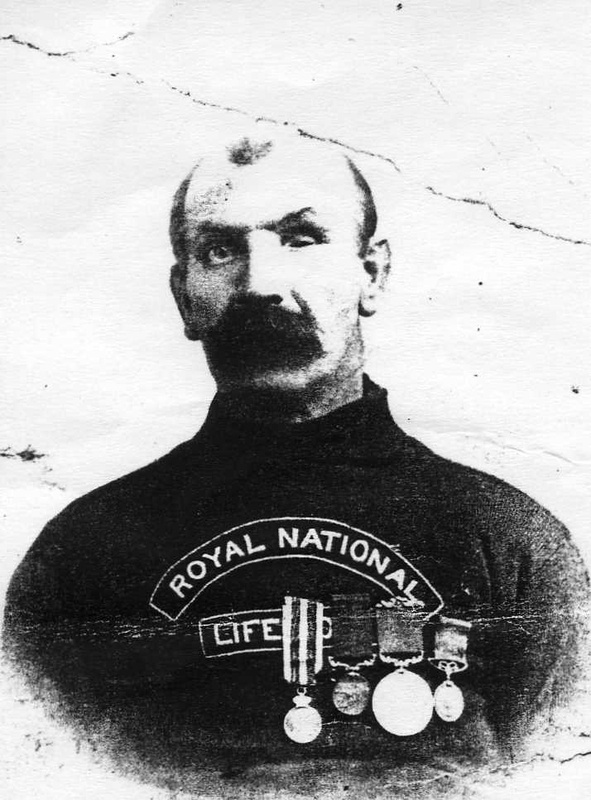 On the 1st October 1907 he was appointed as the motor mechanic for the lifeboat. Thomas also served on the motor lifeboat “Henry Vernon” which in April 1911 had replaced the first motor lifeboat. Thomas is mentioned in several rescues the most famous being the rescue of the hospital ship “Rohilla” which on the 30th October 1914 had run aground just south of Whitby harbour. Away from life as lifeboatman, Thomas enjoyed being a fisherman almost as much as his working life as a labourer in the construction industry. It was while working on one of the piers at Shields that he was injured, Thomas had seen a runaway bogey and to stop it from hitting the other workmen he attempted to wedge a spike into its wheels. Unfortunately however, the spike splintered fragments of which hit Thomas in the face during which he lost his left eye. With an interest in horticulture he liked to grow plants and herbs when not working from which he made herbal remedies that he would dispense to the locals. Despite his disability he enjoyed spending many hours making wooden toys for children. At weekends he would also help at the local Sunday school, were if the minister was off for any reason he would take the Sunday service. Thomas was only 51 when he died in 1927 and to lots of people he was a dedicated hero. Just like his fellow lifeboat men he was always there, always willing to put his own life at risk to help save others, no matter how rough or treacherous the storms, always there to answer the call day or night, fair or storm. 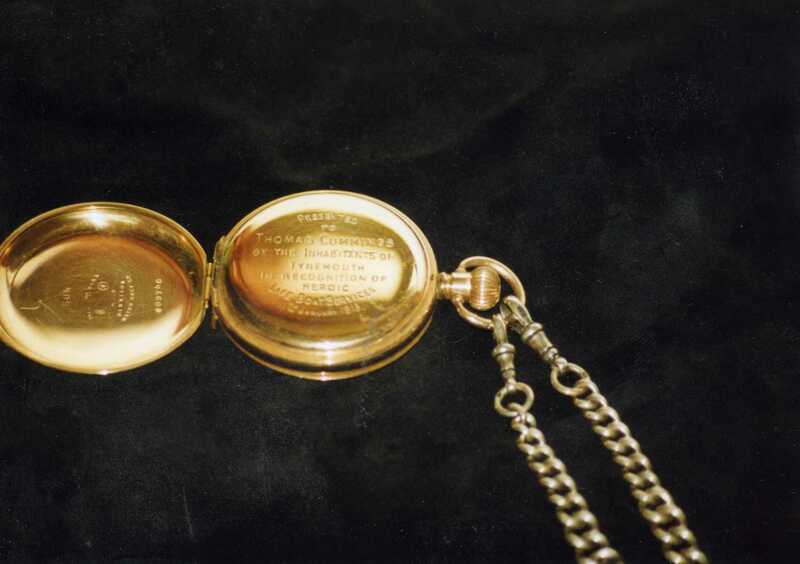 I hope you will find the following two photographs of a gold watch presented to Thomas as nice as I do.